New Map of that Part of the City of New York south from 20th Street on the Hudson and 35th Street on the East River. to settle a land rights dispute between New York City and New York State. The map extends from roughly 32nd street to the Battery and includes the shorelines of Brooklyn and Queens. It illustrates the city's street grid, showing all piers and docks, ferry lines, and the pier line. 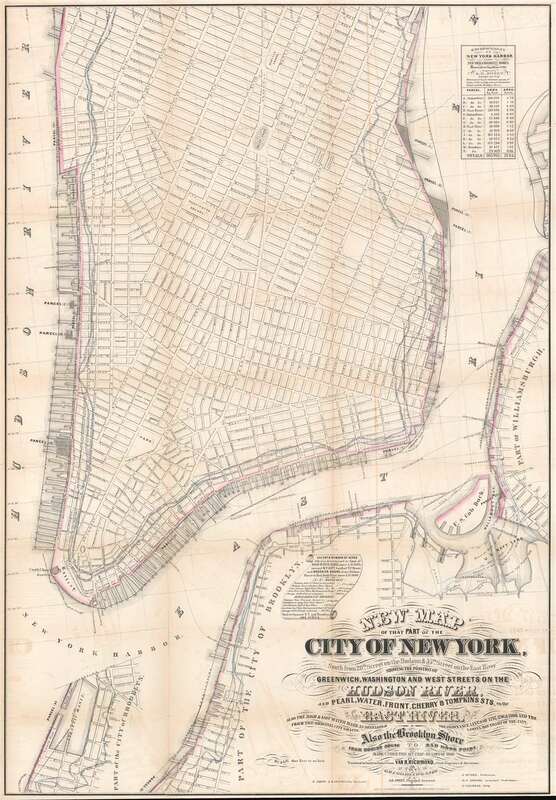 Most importantly, it illustrates the cities original boundary line, noting both the high and low water marks (this was one of map consulted by Egbert Viele to produce the famous 1865 Waterways Map). More importantly, it illustrates the shore boundaries of Manhattan and Brooklyn according to the various surveys and charters completed between 1735 and 1808. This map is a product of a territorial dispute, the first of many, between New York City and New York State. The issue in this case was precipitated in 1857 by landfills approved by the city on the East River between 13th and 18th street, and on Tompkins Street between 22nd and 23rd Streets. It came to a head in 1858, when pier expansion was approved for a parcel known as 'West Washington Market,' on the Hudson River between Day and Vesey Streets. The state claimed all rights to New York Harbor beyond the 1735 boundaries established for New York City by the Montgomerie Charter. The state was willing to allow further development and harbor encroachment on the condition that the lands be purchased or leased from the State, and on the further condition that they do not encroach upon shipping. To assert state rights to these lands, Albany commissioned the civil engineer Orville Whitemore Childs, alongside assistant Sylvanus Howe Sweet, to prepare a meticulous survey of New York Harbor, illustrating existing and proposed landfills and pier development. The survey, which produced this map, was also intended to illustrate the original shoreline of New York and the various charter lines. Including the Montgomerie Charter, establishing the official boundaries of New York City. The map is well, even excessively, attributed. It was executed by Orville Whitmore Childs and his assistant Sylvanus Howe Sweet at the order of R. Van Richmond, state engineer and surveyor. The survey began in June of 1860, and was completed in 1862. The map was drafted by J. Burke and H. E. Green. It was engraved by D. Vaughan and printed in lithograph by Hoffman, Knickerbocker and Co. of Albany, New York. It was originally included in a Report [No. 10] of the Commissioners of the Land Office [of the State of New York] Relative to New York Harbor Encroachments, January 9, 1862. It is exceedingly scarce. The OCLC identifies examples at the New York Public Library, the Brooklyn Historical Society, and the New York State Library. We are aware of only a single other example sold privately. Orville Whitmore Childs (December 29, 1803 - September 6, 1870) was an American civil engineer and surveyor active in New York State during the middle part of the 19th century. Childs worked on the Champlain Canal (1824 - 1825), the Oswego Canal (1826 - 1828), and navigational impor9vment to the Oneida River (1829 - 1830). In 1840, he was appointed chief engineer for New York City, a position he held until 1847. He was the Democratic candidate for the office of State Engineer in 1848. He is known to have worked with other significant civil engineers in New York, including John D. Fay, Ver R. Richmond, and Sylvanus H. Sweet. He left Civil Service in 1848 to work as Chief Engineer for the construction of the New York Central Railroad from Syracuse to Rochester. In 1850, he became involved with Cornelius Vanderbilt's American Atlantic and Pacific Ship Canal Company's attempt to build an interoceanic canal through Nicaragua. When efforts to build a Nicaragua canal got sidetracked, he became chief engineer of the Terre Haute and Alton Railroad, a position he held from 1855 to 1858. In the 1860s he returned to work for New York State, completing a survey to determine the limits and boundaries of the city of New York. Hoffman, Knickerbocker and Co. (1856 - 1862) were lithographer and engravers based in Albany, New York. They were active at least from 1856 and as late as 1862. He firm was operated by Abraham J. Hoffman (1834 - 18??). The 'and Co.' was probably Richard H. Pease, another Albany lithographer. The firm may have been preceded by Hoffman and Co. the partnership dissolved in 1862 when Hoffman relocated to Chicago. Their corpus consisted of government publications, sheet music, book covers, maps, stationary, decorative lithographs, and more. Abraham J. Hoffman (1834 - 18??) was a draughtsman, engraver, lithographer, and engineer active in Albany New York. Hoffman was born in Albany, New York. He may have been the son of L. G. Hoffman, who published Hoffman's Albany Directory in the 1840s. He mastered lithography and engraving in Albany and established himself as Hoffman and Company, possibly with Richard H. Pease. In 1853 he is listed as an Albany wood engraver and his offices were destroyed by fire. From 1856 to 1862 he was part of Hoffman, Knickerbocker and Co. The partnership dissolved and Hoffman moved to Chicago in 1863, possibly following a relative, where he produced lithographs for the drugs store Hoffman Brothers. In 1865 he became the 'and co.' in the Baker and Company lithography and engraving firm. He left the firm a year later to invest in real estate, relocating to River Forest in 1869. He must have done well in real estate as he founded the River Forest Young Ladies Seminary in 1874, which was run by his wife until about 1884. Report of the Commissioners of the Land Office relative to New York Harbor Encroachments, (January 9, 1862). Very good. Backed with archival tissue. Some transference and wear on original fold lines. New York Public Library, Map Div. 09-1209. OCLC 300316516. Haskell, D., Manhattan Maps A Co-operative List, #1089.